This black and gold smokey cat eye has been one of my favorite Fall looks that I have created. This look is dark, smokey, and alluring. I feel like I have been creating a lot of light, bright, and holiday-inspired looks lately. I wanted to change it up and go with something fierce. 1. I moisturize my face with Clinique Dramatically Different Moisturizing Lotion and my under eye area with Clinique Moisture Surge. 3. Using a Beauty Blender, I apply a mixture of Maybelline Fit Me Foundation in Soft Tan and Kat Von D Lock-It Tattoo Foundation in Light 49 to my entire face. 1. With the Real Techniques Sculpting Brush I take the contour shade Sombre from the Kat Von D palette and contour beneath my cheekbones, underneath my jaw bone, along the hairline on my forehead, down my temples, and alone the parallel sides of the bridge of my nose. 2. After blending I apply the middle blush shade in the Morphe Brushes 9B Blush Palette, a shimmery beige peach, using a BH Cosmetics blush brush. 3. Using the same fan brush as earlier, I then apply Jaclyn Hill and Becca Champagne Pop Highlighter to the tops of my cheekbones, my forehead just above my brows, and the bridge of my nose. 1. I shape my brows with the Anastasia Beverly Hills Brow Wiz Ebony. 2. I fill it in with the Anastasia Beverly Hills Brow Powder Duo Dark Brown. 3. I set it into place with the Anastasia Beverly Hills Clear Brow Gel. 1. I take the shade Deep Skin by Morphe Brushes, a satin soft gold peach, with a fluffy blending brush into the crease of my eye and start blending upward. This is going to be our transition shade. 2. Above this I place a second transition shade, Peach Smoothie by Makeup Geek, a soft matte peach beige, to blend out the transition even more. 1. Using the Lorac Pro Palette I then apply Taupe directly into my crease with a smalltapered blending brush using windshield wiper motions. 3. Using a flat shadow brush I take the color Gold from the Lorac Pro Palette , a bright shimmer gold, and press it onto the center of my eye lid. 4. Once the color is as vibrant as I want it to be, I then go back in with a blending brush and just make sure the crease is evenly blended into the gold and there are no harsh lines. I then go back in to the gold and add just a touch more color to the center of my lid. 1. 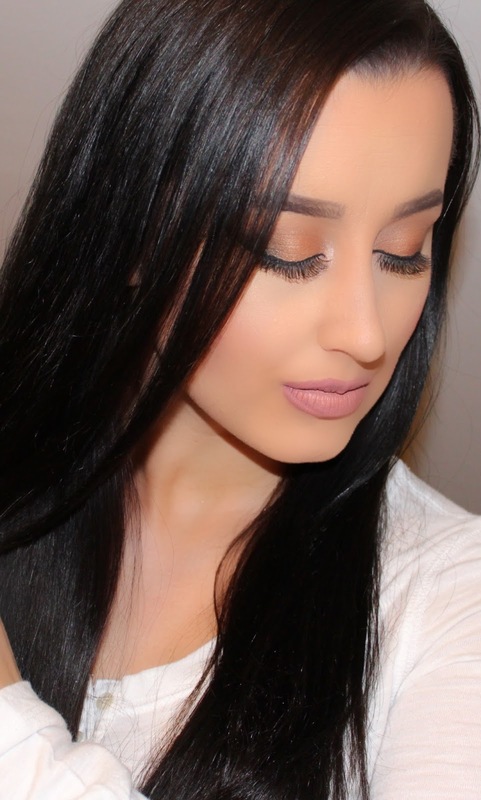 I use the color Black, a matte jet black, from the Lorac Pro Palette to define my outer corner. I apply this directly to the outer third of my eye lid in the shape of a sideways "V" to smoke out the look. 1. I use the shade Shimma Shimma by Makeup Geek, a metallic champagne, to highlight the inner tear duct with a fluffy blending brush, and a small flatshadow brush to highlight my brow bone just below my eyebrow. 2. I take the color Taupe again and glide it below my bottom lash line using a small eye defining brush, making sure to blend into the outer corner of my eye to give the entire look a rounded out smokey eye. 3. To add even more smokiness I go over this color with Black and connect the bottom lash line to the outer corner. 1. I apply Diorshow Iconic Overcurl Mascara to my lashes. 2. For my falsies I choose Eylure London Lengthening Lashes No. 35 and apply them using the Vegas Nay by Eylure London Lash Glue. 1. 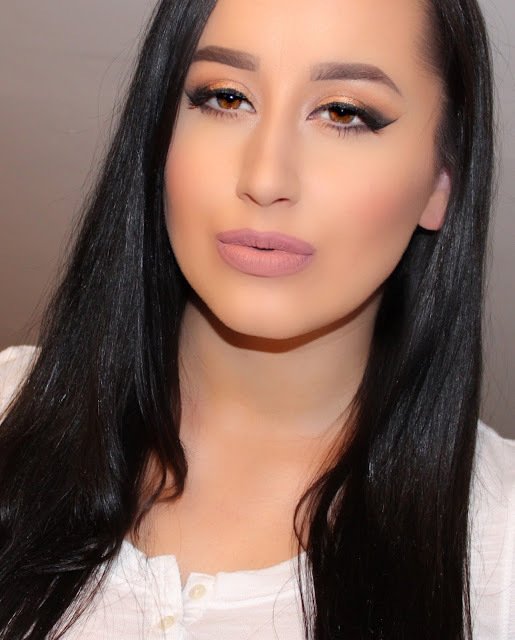 I line and fill in my lips with ColourPop Ultra Matte Lip in Trap, a dusty grey beige. 2. I apply a small amount of Anastasia Beverly Hills Liquid Lipstick Pure Hollywood , a pink beige, to the center of my pout. 3. I blend this color outward using my ring finger until both liquid lipsticks are completely blended together. 4. I set the entire makeup look with Mario Badescu Facial Spray. 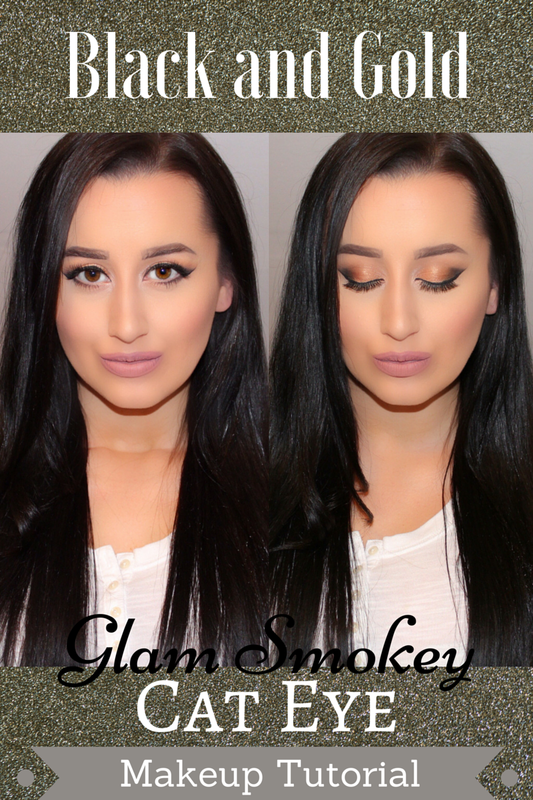 Are you into the "smokey" makeup looks for fall/winter right now? What are your favorite colors to use when creating a smokey eye look?